I guess I've been watching too many Gossip Girl than I can dare to mention.. Hence, the very witty title! Quite proud of it actually. Wore this incredibly eye-catching, colorful, rather sporty outfit last Monday for a lunch date with sis and then running some errands. Anyway, can't help but feeling like a walking sorbet with the pastels and that's just the way I like it. I'm off to pack for my HongKong trip this Wednesday.. Also.. Planned to take outfit pics around the house for a scheduled post while I'm away. Happy Sunday, all! sporty sweet outfit. Love pastels! I love this pastel, sporty outfit ;) Very cute. The top is so cool! have a save flight to Hongkong! stunning colors!! beautiful blouse and cute shoes!! ahaha the rainbow cake love it ! delicious rainbow cake like your outfit :D it looks pretty nice on you, gorgeous! and cute camera! where did you buy it? i'm jealous of your trip to hongkong, i want to go so badly! your blouse is awesome, love the colours and the colour blocking! 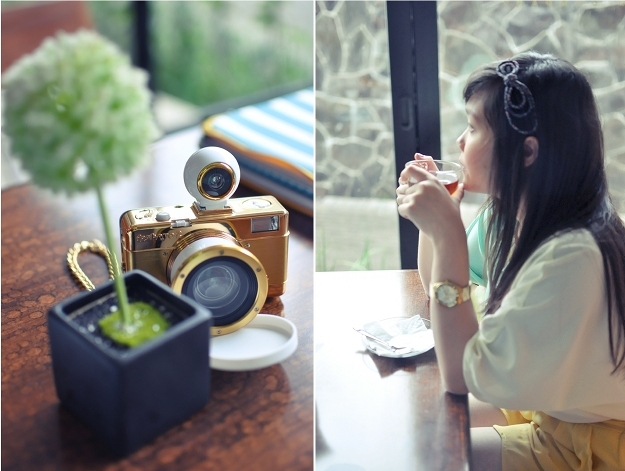 Love love love your oxfords & camera, pretty! Have fun in HK! OMG how cute is that camera!!! Is it a lomo fish eye? You have to tell me where you got it from. You look great too, love the shirt. your yellow short and headband are great. You look so cute in the outfit!! Would you like to follow each other? awesome shirt! and oooh,t hat cake looks interesting!! following you on twitter (mie) and blogloving!